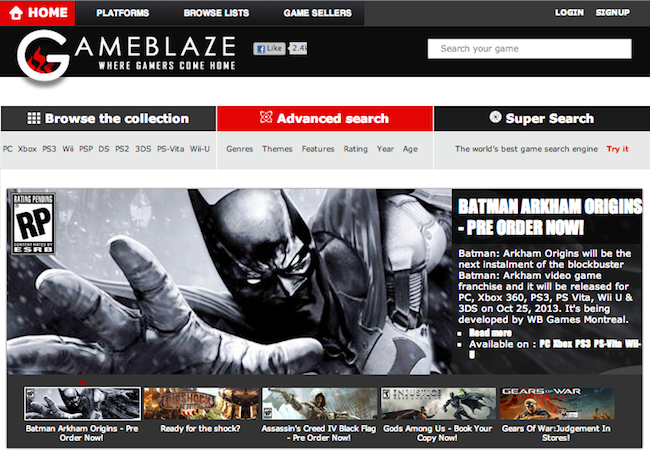 Gameblaze, an online aggregator of digital games, has gone global and launched its international site Gameblaze.com. Owned and operated by Delhi-based TridentShoxx Labs Pvt Ltd, it has now partnered with Microsoft, Origin EA, Best Buy, TigerDirect, GameStop and Amazon in the US, and Play-Asia for both the US and India. Going forward, the company plans to expand to the UK and Canada, followed by Europe and other parts of the Asia-Pacific (APAC) region by the end of this year. The Indian version of the site is now available at in.gameblaze.com. The company has also added a number of features to both the sites such as price and stock tracking, which enables users to get information about dropping game prices in real time. "We are also in the process of creating our own ad engine for games, as Google ads are not well optimised for gaming websites," said Chetan Kumar, founder of Gameblaze. Kumar is an IIT-Delhi alumnus who had worked on mobile video streaming solutions for several telecom providers such as TIM (Italy), Vodafone (Spain) and 3 (UK). He later joined iXiGO.com (in its pre-launch stage) and also started up Metaaso Solutions with a colleague. Gameblaze started as a pure e-commerce site, but later (October 2012) changed its business model and became an aggregator for other e-com sites selling games. It means earlier the company was competing with horizontal e-tailers like Flipkart, Indiatimes and others, but it now partners with them to drive sales. "We planned to follow a two-part model, according to which we would be an e-commerce player in India while internationally, we would partner with a vendor and sell its games. But we were approached by a number of vendors like Amazon, GameStop, etc. So we decided on the aggregation model for outside India. But then we realised that managing the offline aspects of our e-commerce business (like logistics and deliveries) in India was also becoming a hassle. So we decided to shift our business completely, both in India and abroad," Kumar had said at that time. As of October 2012, the Indian site was offering 3,000-plus game titles and had four Indian e-com vendors on board including Flipkart, Indiatimes, Infibeam and BuyThePrice (now acquired by Tradus.com). The International site is offering games for diverse platforms such as PC, Xbox, PS3, PSP, Wii, DS, 3DS, PS2, PS-Vita and Wii-U. You will find a number of genres like first person shooter, racing, action, etc., and the games can be searched by various parameters such as themes, features, age rating, release year and Metacritic rating. Going forward, the company also plans to offer product aggregation in other verticals like gaming hardware, accessories, monitors, audio systems and more, but those will be essentially related to games.